“I am bleeding just a little bit,” said Raymond McCauley. “Might I ask for a little assistance?” McCauley, chair of Singularity University’s biotechnology and bioinformatics track and a biohacker, had just implanted a microchip in his hand. He was giving his talk at Singularity University’s Summit Europe on the $0.01 human genome, drag-and-drop genetic engineering, garage biohacking, cheese from genetically modified yeast—a whirlwind tour of future biotech. But the real thrust of this particular talk? Cyborgs. McCauley is aware that the idea of incorporating technology into our bodies may seem repellent or unnatural to some people. But, he said, many of us are already cyborgs. Vaccination, for example, is a kind of technological augmentation. “We are now different than we would be as just baseline humanity,” he said. McCauley is a hacker at heart and has no qualms about experimenting on himself to prove a point. So, in the middle of his talk, he called piercing professional Tom van Oudenaarde onstage and announced he’d be implanting a chip in his hand. xEM 4200 RFID tag to scale. That said, the number of devices we might control with an implant is set to grow in the coming years. And the truly compelling “value proposition” may lie elsewhere—in health and medicine. Currently, health monitoring is a prime argument for incorporating technology into our bodies. Known as quantified self, it’s thought that the more we know (thanks to sensors), the more we can do to prevent disease before it’s too late. Wearable sensors, for example, have been popular in tech recently. Most of these are the kind that go around our wrists and track activity, heart rate, and the like. But there are others. McCauley, noted wireless earphones that measure vitals. However, it’s increasingly recognized that there are problems with wearables. They’re easily forgotten at home or simply laid aside. They lack accuracy. They can measure some vital signs, but certainly not all. One potential solution we’ve explored is sensored clothing. Indeed, an undershirt or pair of underwear or socks are less likely to be left behind in the morning. You can see where all this is going—the more intimately connected, the more useful. Perhaps the next steps are implantables and insideables. The fact is, if it’s a matter of better health, staying outside the hospital, maybe even living longer—people are likely to be more amenable to the idea of putting tech in their bodies. Pacemakers are a contemporary example, and implantable insulin pumps are just around the corner. Health benefits of these implantables make them acceptable. But beyond dire needs, like everyday body monitoring of healthy people, widespread use will likely require smaller, less invasive devices. 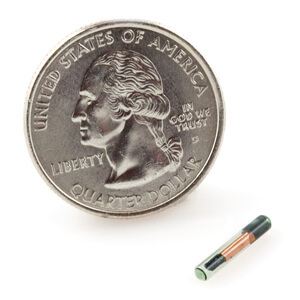 And there’s reason to believe miniaturization won’t end with a chip the size of a grain of rice. Google recently made headlines for its cancer-detecting magnetic nanoparticle project—still largely theoretical—and earlier this year, for their work on contact lenses to measure glucose in diabetics. Others are working on body-monitoring skin patches and tattoos. And we’re learning to power miniature electronics at a distance using radio waves. The day after getting his implant, McCauley returned to the stage to report. He was just fine he assured the audience. More than fine in fact. He’d made a video showing off his newly acquired powers. The message? Even today’s implantable tech is relatively non-invasive and somewhat useful—two properties that will only improve in the future. Perhaps RFID implants like these won’t ever catch on in a big way. But it raises a compelling question: If implantable technology were no more invasive than a vaccination—where would you draw the line? Or would there even be a line?